Andreas Trossek offers his contribution to decoding Marta Stratskas's and Margus Tamm's exhibition "Never Odd or Even". When we survey the past, the pathetic materialism and paucity of idealism in the world at our current moment at the start of the 21st century is of course astounding. On the whole, however, the nationalist discourses, democratic principles, industrialization, urbanization, technological progress, the liberation of the subconscious and other modernist utopian ideals that stirred the significant masses barely one hundred years ago, had admittedly, already lost their full positive potential by the time of the two world wars. By then everyone had something to criticize the other for. The socialists did not like the capitalists, the nationalists the cosmopolitans, the Estonians the Soviet forces who had come to "liberate" them, the "generation of 1968" the university professors who tried to teach them and so forth. The second half of the 20th century was already unfolding with two economic models testing their strength against each other in a bipolar world, and it was here that the only definitive ideological arena developed and remained – the question of the efficiency of production. And when the cold war ended and the Berlin wall fell, it became clear, even to China, that globally, the only desirable freedom in the 21st century was consumer freedom. Now you can buy Coca-Cola in Iraq and Afghanistan, and everyone is happy. Against this backdrop the noble avant-garde ideals of the early 20th century are of course nothing more than a nice legacy that we like to "scratch" with our postmodernist and academically distant sense of all knowing, like scratching some harmless little puppy behind the ears. This little dog is certainly endearing, and from certain angles even reminiscent of a small wolf, but we know that it no longer lays down the rules of the game – it does not decide who is and is not allowed to enter its domain. Namely, for the more experienced viewer, the first inevitable association conjured by the exhibition "Never Odd or Even" was that this is like a reunion of the duo Avangard (Margus Tamm and Sandra Jõgeva) or the trio Pink Punk (Margus Tamm, Sandra Jõgeva and Kristin Kalamees), both of which created quite a furore in the Estonian art world in the early 2000s, except this time in a different configuration (Margus Tamm and Marta Stratskas) and using different media (i.e. installation instead of performance). Avangard's creative output was also entirely postmodernist, cynical, one-dimensional and charged with adrenaline, but also completely free of the desire to improve the world and any transcendental aims. Even the name of the group Avangard on its own rang out like a bad joke or gibe let fly from some advertising bureau at the expense of the art world, because pardon me, but in what sense can the "avant-garde", like that of the early 20th century, exist in art today? In the same way, the title "Never Odd or Even" begs the question whether the exhibition was as straightforward as it first seemed? 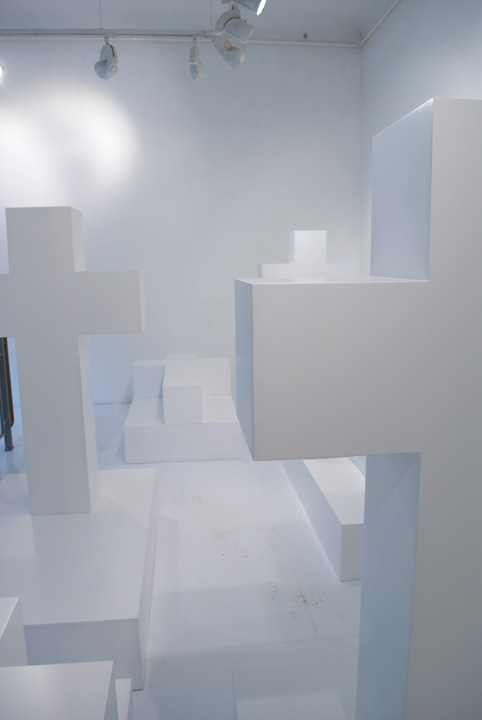 Is the upper floor of Hobusepea Gallery a "cemetery" and the cellar the… "underworld"? And the two spaces… are they connected? "Never Odd or Even" is a palindrome and the two artists made it clear that attempting to translate it into Estonian was unnecessary. In the brief press release, that read like a "user manual" and included a (miss)quote by Karl Marx, it appears that the viewer is even encouraged to remain suspended between the two floors of the gallery, because art is supposedly a "secret". On the street level there was a "cemetery" composed of standardized modules – a completely bright white environment with shafts of light from multiple projectors creating a clinical atmosphere. The mathematically precise and well-crafted modules established a scene that was as beautiful and inviting as any iStore, IKEA or Stockmann showroom. Downstairs in the darkened cellar there was a large light-box with a psychedelic photomontage à la Pop Art of photographs of nature spliced together with Tauno Pääslane's photographs of glass sculptures by Lotte Jürjendal. Taavi Tulev provided the soundtrack – a high frequency whistling sound that is undoubtedly harmful if listened to for an extended period. So – white and black, dark and light, death and Paradise (or Hell, Valhalla or some other notion of the "other side"). An exhibition…about a death drive? The subconscious? Consumerism? A parody of the monument to the Estonian War of Independence? In reality it is of course obvious that this cryptic project is primarily the result of the partnership between Margus Tamm and architect Argo Peever, a partnership that has its own history. (Marta Stratskas, cited as co-artist in this exhibition, is a young neo-expressionist painter, so it is logical to assume that she had a role in the concept, but her contribution is not obvious in the exhibition itself.) Margus Tamm's solo career began, as many may remember, after the breakup of the "bands" Avangard and Pink Punk when, with the help of Argo Peever, he had a solo exhibition at Tallinn City Gallery in March 2008, titled "That was the best party. And I wasn't there". Even though there were no articles written about that exhibition (or to be more precise, site specific installation) and it did not win any local art awards, it was without doubt one of the best art projects of 2008. In retrospect a number of key figures in the Estonian art world have praised it and now consider it to be Margus Tamm's (and Argo Peever's) best exhibition yet. Tamm's collaboration with Peever (as an architect) continued at Hop Gallery in 2011 with their project "Let's Face It!" and simultaneously with an even a more spectacular project "Face It", which was planned as part of Tallinn's urban installations festival "LIFT11". The plan was to build a temporary corridor-staircase adjacent to the classicist sculpture of the Russalka monument erected by the Russian Tsarist authorities in 1902. Tamm and Peever's competition design passed all the preliminary engineering, technical and legal stages that were necessary but it was never realized due to the paranoid doubts of the Tallinn City Government, which in the end outright forbade it. Evidently the authorities were afraid of a repeat of the April riots in 2007, because the "death angel", erected in memory of a sunken ship, has become a popular venue for wedding photographs among the Russian speaking population. Yet what Tamm and Peever planned was a relatively straightforward spectacle that provided the public with the opportunity to look eye-to-eye with the hierarchical aesthetics of classicism, and therefore, the project was not directly political. Paradoxically, the decision to ban the project made it more voluble socially and politically than if the project had gone ahead. This was a clear indication that the authorities in Estonia still consider the majority of the population to be stupid and need to be controlled like a herd of animals. Go shopping instead! Shopping centres provide plenty of choice and are available to all. "Never Odd or Even" with its flaunting non-communication might be showing us where this kind of policy will end up – in the cemetery, without any special lessons or wisdom to be learned. It is simply not the time for big ideas or ideals any more, and it cannot be helped. Andreas Trossek is chief editor of KUNST.EE.